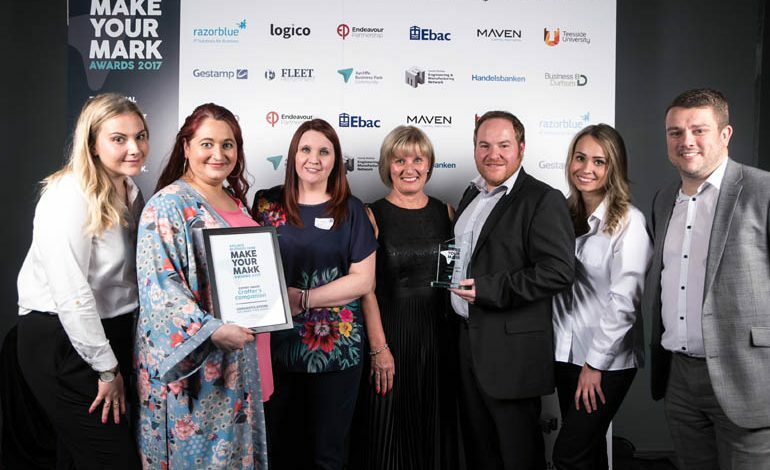 Crafter’s Companion celebrated the end of another hugely-successful year when they were awarded the Export award at Aycliffe Business Park’s Make Your Mark event. Crafter’s was recently ranked at number 31 in this year’s Sunday Times SME Export Track 100 list after experiencing 72% year-on-year growth in export sales. One of just four North-East companies to make the list, Crafter’s Companion has grown significantly from a small start-up into a global enterprise, now exporting to 32 countries worldwide across Europe, Africa, Australia and North and South America. Founded in 2005 by award-winning entrepreneur Sara Davies, Crafter’s beat off competition from Roman and Mill Masters to pick up the award. Sara Davis said: “I’m absolutely thrilled that Crafter’s Companion has won the Export award at this year’s Make Your Mark! “From a small Durham-based start-up we have grown significantly in the last 13 years, expanding the business in 2016 and opening the first of our three retail stores. “In that time we’ve also become a global enterprise and now export across 32 countries worldwide across Europe, Africa, Australia and North and South America. “2018 has been another year of amazing growth for the company, with our export business growing by £3.6m in 2017-18 to a total of £13.8m, and it’s a testament to all the hard work of our teams across the UK, Europe and US. I’m delighted and this is a real achievement for us as a company. “We ranked at number 31 in this year’s Sunday Times Lloyds SME Export Track 100 list, after experiencing 72% year-on-year growth in export sales, compared to a listing of 52 last year. “With our roots firmly in the North East, we were one of only four companies in the area to make the list and we ranked the highest overall, which is amazing. The award was presented by sponsors of the award Ebac, another major Aycliffe exporter. Ebac’s group financial director Graham Currie said: “Ebac believe that it’s important for businesses to play an active role in the local community, demonstrated by our sponsorship of various grass roots sporting clubs, Durham Cricket Club, Darlington Football Club and football clubs in the Northern League.